My friend Libby, with help from our friend Sandy, prepared a wonderful aubergine/eggplant gratin for our lunch in the Umbrian countryside towards the end of last September (i.e. in 2017). It was a lovely sunny day, one that allowed us to enjoy the al fresco backdrop to it all, served over what was once an olive millstone. As we tucked into the dish, we commented appreciatingly about it and drew similarities to the classic Parmigiana di Melanzane. Sandy was quite amazed at how much oil the sliced rounds of aubergine guzzled as she pan fried them. For the rest, it was a fairly simple dish to prepare. 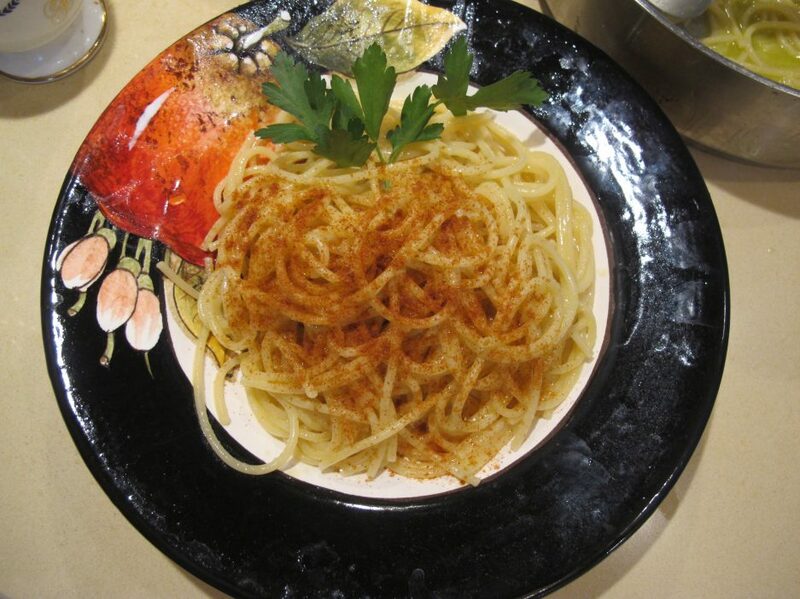 The sauce was made with chopped fresh tomatoes, garlic and olive oil, and the layers were showered with grated parmesan. They are then cooked in the oven until done. Fresh basil added at the very end. And more parmesan can be added to the serving on the individual dish. Instead, a Parmigiana di Melanzane, a proper one that is, ranks top of the list in the High Maintenance Category of summer recipes. Which is why it is so highly appreciated at the dinner table when a friend or family member serves it and, also, why it can be the cause of much gustatory disappointment when it doesn’t live up to its standards. There can be no cheating when it comes to a good Parmigiana di Melanzane, although variations are admitted (see two links at the bottome of this post). And that means that the slices must be fried in olive oil and not ‘cooked’ in the oven (roasted). When I overhear comments like “Oh, the roasted/grilled version is much lighter and just as good”, I turn my eyes heavenwards or allow myself an inward groan. Lighter it may be but never as good. The parmigiana di melanzane comes with not a little baggage when it comes to both historical fact and conjecture (not to mention nonsense). Dishes were cooked “alla parmigiana” (i.e. cooked with parmesan and inside a dish that could be placed in an oven) well before aubergines even arrived in Italy. The Latin word “parma” means a shield – and the way the sliced aubergines are set out in the dish does indeed resemble a short of ‘shield’ – so much so that an emiment Italian food historian, Massimo Montanari, reckons that could be behind the naming of the dish. The recipe most likely originated in Naples whose rulers were also those of Sicily until Italy became a nation in 1861 – and that would explain why both lay claim to the orgin of this recipe. I think I’ll just get on with it now and leave history behind for a bit. This is how I prepped the aubergines/eggplants – I took a lot of skin off. I sliced them length-wise and sprinkled plenty of salt over them. I placed the slices between two large plates. I put a heavy saucepan over the plates, to squeeze the aubergine slices and help rid them of whatever liquid in them makes them slightly bitter. This was quite the tower I created in the kitchen, eh!, what do you think! It didn’t take long for the aubergines to start ‘perspiring’. So much so, that quite a lot of liquid started trickling out. I had left (if I remember correctly) the aubergines to sweat away for one hour – and then threw away the liquid and put the slices of aubergine to rinse in a tub of cold water. I then patted them dry, or as dry as I could. While all that was going on, in the meantime, I was making the tomato sauce, with fresh tomatoes. It was the height of Summer after all when tomatoes are at their best. Get hold of the sweetest tomatoes you can lay your hands on, cut them in half, cut an onion in half, sprinkle plenty of salt and add a few basil leaves. Turn the heat on and cook for about 20 minutes. Use a food mill to strain the tomatoes. Don’t throw the watery bit away – you can use it in another sauce. Or make a Bloody Mary with it! Our sauce can be cooked down now. Add some olive oil. Cook away, add some salt, taste, add a pinch of sugar if you think it needs it. Set aside. Pour plenty of olive oil into your frying pan. Dry the slices of aubergine as much as you can – and then get frying. This is the busy bit: the aubergines being fried in batches, then left to drain on a colander. But it gets exciting too! Notice how little oil drips off the fried aubergines? See below. Time to start assembling. The hard part is over. Spoon some sauce onto the bottom of a baking dish – not a lot. Place one layer of aubergines, some mozzarella, plenty of grated parmesan. Regarding the mozzarella: cut it up and put it in a colander/sieve for about one hour before use. That will help to dry it out. Add some tomato sauce: not too much. Repeat until you finish all the aubergines. Add one last dolloping of the tomato sauce on top, as well as some more olive oil. Bake in an oven at 200°C for about an 40-45 minutes (maybe less? I can’t remember, sorry – but you’ll see when it’s ready). A parmigiana di melanzane is best eaten at room temperature. Yes, it does take a lot of time and there is quite a lot of fuss. But, maybe, once a year? Is it worth it? Of course it is. Below are the links I mentioned earlier on, that are a variation on the theme … These other two recipes were also good, by all means, but this one ranks highest in my opinion. And I suppose I can put that down to the salting of these nightshades, these shady aubergines/eggplants. “Zucchine ripiene”, Italian for “stuffed courgettes”, is such a commonplace Summery dish around these parts that butchers sell them already prepared for you – all you have to do is cook them. I wrote a post about them a while ago (six years ago! – here’s the link: https://myhomefoodthatsamore.wordpress.com/2012/09/07/stuffed-courgettes-zucchine-ripiene/ ). In that post, I showed how I did the stuffing myself. This time, I had bought the ready-to-go courgettes from the butcher’s. That time, I cooked them in a saucepan … THIS time, I decided to bake them in the oven. Here it is, playing peekaboo from the bottom of a flower pot. And here is another one … just like Topsy, the character in Uncle Tom’s Cabin, who claimed that she did not know where she came from, she “just grewed”. Mentuccia is very often the preferred herb in Rome for stuffing artichokes. Some prefer parsely – some a mix of the two. I have added a bit of mentuccia to a tomato sauce for a pasta dish. A little goes a long way, it is quite potent. That day, I was feeling very daring, and decided to depart on two accounts from the traditional way of cooking stuffed courgettes. A) I would add mentuccia and B) I would bake them in the oven, instead of braising them on the cooker/stove top. I am such a rebel … a pennyroyal iconoclast. Just a splash of olive oil and then a few sprigs of mentuccia. In go the stuffed courgettes and a layer of cut up tomatoes. Salt too. And now … bake in a preheated oven at around 200°C for 50 minutes or until done. Forgot to mention that I baked them with the lid ‘on’. If you haven’t got a lid you could always use aluminium foil. Very easy to make. And the mentuccia did indeed add a little bit of ooomph. Warning: this dish needs to be served with plenty of bread to soak up all the lovely sauce. A glass of wine … or two … to keep the conviviality going. I made pasta alla Norma a couple of weeks ago and a Summer would never be complete without having it at least once. I wrote extensively about this recipe in a previous post which I would invite you to read, if only because I talk about its provenance and history as well as the steps to making it. The main difference between the way I cooked it then and more recently is that I salted the aubergines before frying them this time. A little more work, yes, but worth it. Another difference is that I used onions instead of garlic to make up the tomato sauce. What can never be changed is the type of oil with which to fry the slices of aubergine – only extra virgin olive oil can be used for this dish. Once the pasta was on the boil, it was time to ready the sauce into welcoming it within the confines of a large saucepan. I began by throwing in some fresh basil and a little olive oil. I then poured the sauce in and turned the heat on. I also grated some Ricotta Salata cheese. This is a ricotta that has been salted and allowed to age and dry off. Sorry, I didn’t take a photo. If you look closely, you can see some white ‘bits’ in amongst the pasta – that is the ricotta salata. What I did was drain the pasta directly into the saucepan add a little of the cooking water and finish off cooking the pasta there. Only afterwards did I add the fried aubergine slices (so as not to damage them) and, lastly, the roughly grated ricotta salata – together with extra basil. I was having a bit of a basil frenzy. It was a casual outdoor dinner at a friend’s house and she was okay about bringing the pasta to the table in the saucepan. Once we had plated up, everyone was free to add more ricotta salata to their plate. Oh … sigh … how I love al fresco meals and Summer in general. P.S. It has been the weirdest late July/August ever around here in the Castelli Romani – we’ve had nothing but buckets of rain late in the afternoon. Not my idea of Summer evenings at all. But, still, a Pasta alla Normal is an uber-summery pasta dish and is best enjoyed this time of year. Bugs Bunny comes to mind because this naughty little cartoon film protagonist loves his carrots, only he eats his raw and mine were braised. I like carrots both raw and cooked – so old school, so old fashioned, so ‘ordinaire’, what’s to gush about – and yet we still eat carrots with gusto, even though we may not rave about them. When we lived in Lebanon many decades ago now, we would often be served carrots sliced lengthwise, seasoned with lemon juice and salt. My grandmother’s comment was that she had noticed how very few Lebanse wore spectacles and she was sure that was due to all the carrots they ate. The arbitrariness of her conclusion continues to made smile within every time I serve carrots as a ‘proper’ vegetable side dish at the table, as opposed to a mere component in a salad. Have you ever tried cooking carrots with a little bit of butter and a hint of grated fresh ginger? Or, the French way, with plenty of butter and maybe some garlic and definitely plenty of finely chopped parsely? Carrots and oranges (my invention) ? Whatever. The other evening, as mentioned in my last post, I had a big bunch of carrots in the fridge and decided to make them the star attraction of the evening. Basically what I did was braise them. Carrots take longer to cook than one would think, in order to extract the right amount of sweetness from them. So this does not constitute a last-minute preparation. That said, there is definitely nothing difficult about the recipe. I don’t know about you but I like my carrots peeled. Start by cooking the garlic in some butter and olive oil, including the sprig of rosemary and some pepper corns. Then add the carrits, whole, and sprinkle plenty of salt. (I had to cut one carrot in half because it wouldn’t fit in the pan). Toss or shove the pan around vigorously so that the carrots get coated all over in the melted butter and olive oil. Add half a glass of Marsala (or other sweet or fortified wine of your choice). Raise the heat and allow the alcohol to evaporate. Remove the sprig of rosemary. Now add about half a glass of plain water. Cover with a lid and cook over a low heat for about 15 minutes. When I removed the lid, I pierced one carrot with a sharp knife to check on how ‘done’ it was. I was surprised to find it still too ‘hard’. So I plopped the lid back on and cooked the carrots for another 15 minutes. Or so I seem to remember. Maybe a little longer? In the event, do keep an eye on the carrots because, although we do want them to sort of caramelise, we don’t want them to burn. I caught mine in the nick of time. Mini hamburgers/meatballs, a hipster salad, and an old-fashioned bunch of carrots. Crazy dinner. But yes, the carrots were very nice. I’ll be making these again. A cover-up for making do with what I found in the fridge/freezer that day, to serve as dinner for me and my husband. To cut a long story short, we were supposed to have gone out that evening but events beyond our control weighed in. What-to-do-What-to-do-What-to-do? All I found was: 1 apple, some green salad leaves (not many at that), a packet of bacon, and some minced beef left over from a previous burger dinner. I did have a massive bunch of carrots and decided to make them the star dish of the evening (I’ll write about them in another post). For the rest, I was basically ‘forced’ into being ‘creative’. As fate would have it, I had an old-fashioned soup tureen staring at me near the kitchen and waiting for me to find a place to put it away. For some weird inexplicable reason, I decided to use it as a salad bowl that evening. And then burst out laughing as I thought of my dear friend Victoria, and our shared dislike of hipster food presentations that were crowding Facebook a few years ago. Never say never, eh Victoria? I began by frying the bacon. I sliced an onion and squeezed plenty of lemon juice over it. Once the bacon had cooled, I added it as well as slices of apple and the green salad leaves. I had sprinkled lemon juice over the apple prior to that, to prevent the slices from going brown. Also, I seem to espy one solitary max two small tomatoes? I’d forgotten about those. There you go. And the soup tureen was just the right size for salad for two. The braised carrots, the star attraction that evening, provided the idea of abundance and bright colour inspiration. There were a few meatballs too for us (and ketchup sssssh, don’t tell anyone). My husband had the good grace to smile at what he saw when he came home … and didn’t notice the raw onion until the next morning, by which time it had left a distinct impression on his palate. I think I might make this salad again you know …. but call it something else. BLT salad anyone?